This entry was posted on April 21, 2017 by Jessica Anderson. 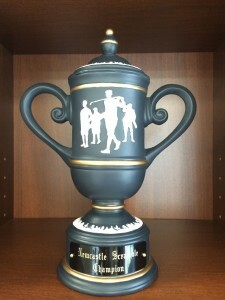 Golf tournaments are fun, competitive events where awards are given to the tournament winners. Usually the first, second and third place finishers or teams receive trophies, but sometimes special awards are given as well. No matter what size budget you have, you can find a perfect award for your tournament winners. The most important thing is to recognize a well-played round, with the hardware to prove it! What Kinds of Awards are Appropriate for Golf? The first step is to define what skills and categories you'd like to award at your tournament. 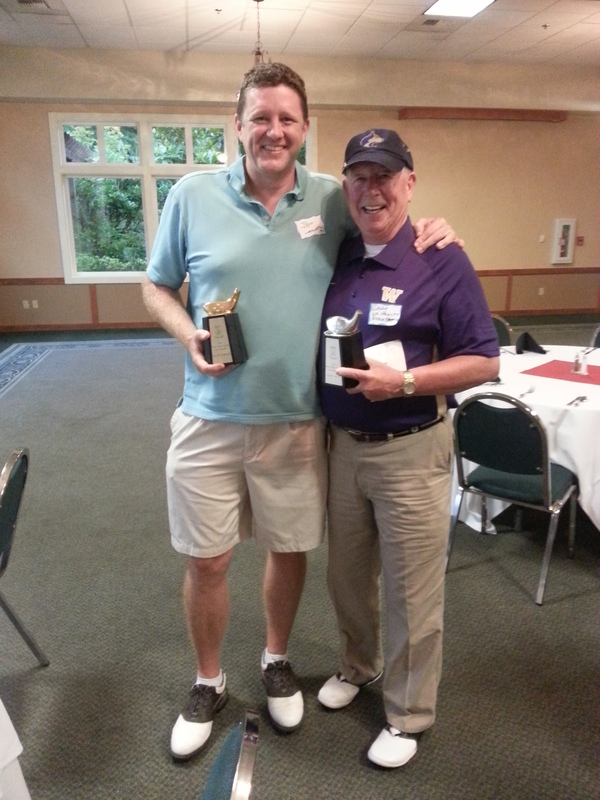 Jeff with his mentor, Gary Ausman, winners at the Evan's Scholarship Golf Tournament. Tournament Winners: Almost every tournament awards a winner or winning foursome. Popular awards include Cameo cups and crystal golf awards for larger budgets; resin golf awards for smaller budgets. Gift cards to the pro shop make great prizes too. Joke Awards: We see many joke golf trophies come through our production facility. The most popular by far is the the Golden Throne Golf Toilet, generating lots of laughs at your banquet. Participation Prizes: These include personalized golf balls, bag tags, golf towels, divot replacers and other small personalized tools to remember the event. It's up to the organizer to decide which of these they'd like to include at their event. Our most popular golf award, the Cameo Golf Cup receives 4.8 stars out of 5 from customer reviews. Most tournaments host a dinner or social gathering shortly after the tournament ends. This is the perfect opportunity to have the attention of the participants for the awards presentation. Below are some tips of presenting your awards at the banquet. 1. Timing: The awards presentation should occur as soon as possible after the totals have been tallied and shortly after most people have eaten. This is important because people will leave if they have other commitments or are not eligible for an award. 2. Pass out the awards in reverse order. Start with the third place winner (Net Score first, followed by Gross Score), and proceed to the second place winners (Net Score first, followed by Gross Score). 3. Next recognize special awards, such as the ‘Closest to the Pin’ and the ‘Longest Drive’ winners. 4. Last place: Add laughter by awarding the worst place team with a joke trophy. The suspense of who won should be high at this point! 5. Finally, award the tournament winners (Net Champion, followed by Gross Champion). 6. For raffle or door prizes, stagger them throughout the awards presentation. Give a couple of larger prizes after the winners have been announced; participants often view the last raffle prize as their cue to leave. I hope that these general guidelines help you create outstanding awards for your next golf tournament. No matter how many times they’ve won, all golfers appreciate recognition for a well-played round! Editor's Note: This post was originally published on April 29th, 2014. It has been updated for content.